"Small, intimate New York School of Interior Design, which is located on Manhattan's toney Upper East Side, is "totally devoted" to - you guessed it! - interior design. NYSID is one of the most prominent schools of interior design in the country and graduates go on to work for big kahunas like Skidmore Owings & Merrill, Laura Ashley, and Ralph Lauren Home." What are the top 3 reasons someone should attend New York School of Interior Design? What is a typical New York School of Interior Design student like? Describe the type of person that should attend New York School of Interior Design. A person who is creative, determined, and most importantly a risk taker. You have to be willing to go out of the box. Different is what sells. NYSID is the only institution of higher learning in New York devoted exclusively to the design of the interior environment. We are a nationally ranked, independent, accredited college of design and have been in continuous operation since 1916. Our graduates go on to work in--and establish--prestigious commercial and private firms (like David Scott, Mica Ertegun, Anne Eisenhower, Rick Shaver, and Mariette Himes Gomez, to name a few). NYSID alumni, as well as current students, see their work regularly featured in publications like Interior Design, Elle DÃ©cor, Architectural Digest, and Metropolis. The people who work and study here love what they do; they're committed to making a difference in the landscape of this profession. They win awards. They change the way we live. 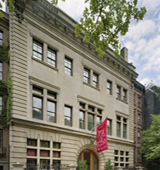 Our beautifully renovated Renaissance-Revival campus is located on Manhattan's Upper East Side, a heartbeat away from world-renowned museums, galleries, and design showrooms. We have state-of-the-art computer-aided design technology in our classrooms and high tech plotters and graphic printers in our studios. We are as proud of our history as we are of our commitment to the cutting edge. Local professionals and academics alike use us as a resource. NYSID'S faculty is full of successful and actively practicing designers, architects, visual artists, writers, and scholars. Class sizes at NYSID are small (studios typically range between 10 to15 students), so you'll get to know your teachers well, and they you. If you study here, we will encourage you to seek out your full creative potential; we will nurture you, guide you. We'll also challenge you to love hard work. Why? We feel it's essential our students acquire all the elements and skills they'll need to grow, with design, through the 21st century. Interior design is thriving and full of opportunities. What are the top 3 things that students do for fun at New York School of Interior Design? Campus housing is available for undergraduates. Housing deposit : $500.00. Housing deposit is not refunded if student does not enroll.. No cars. No pets. 45% of freshman live on-campus. 9% of students graduated in the top tenth of their class. The average student pays $30,105 for tuition, fees, and other expenses, after grants and scholarships. Total stated tuition is $25,830, in-state and on-campus, before financial aid. Learn more about financial aid at http://www.nysid.edu. Estimate the net price for you at http://www.nysid.edu/netpricecalculator. Want more info about New York School of Interior Design? Get free advice from education experts and Noodle community members.